The Philippines’ largest budget carrier, Cebu Pacific (PSE:CEB) launched the first direct flights to the island of Camiguin on April 15, 2013. 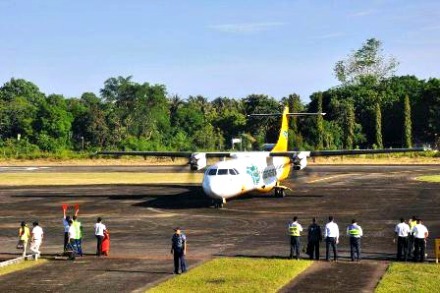 The thrice weekly service from Cebu utilizes an ATR 72-500. The Monday, Wednesday, Friday service departs Cebu at 6:45am and arrives in Camiguin at 7:25am. The return flight will depart Camiguin at 7:45am and arrive in Cebu at 8:25am. Lowest year-round fares to Camiguin start at P588. CEB representatives along with Mactan Cebu International Airport Authority General Manager Nigel Villarete and DOT Region 10 Director Catalino Chan sent off the maiden flight passengers from Cebu, while Camiguin Governor Jurdin Jesus Romualdo, Mambajao Vice Mayor James Ederango and DOT Region 10 Director Catalino Chan were present when CEB launched the service in Camiguin. “With this new route, Cebu Pacific opens the island of Camiguin to even more foreign and local tourists, by offering a direct service and the lowest fare option to leisure travelers. We hope that establishments in Camiguin are ready for the many foreign and local tourists we foresee we will fly to this island,” he added. CEB will also launch flights from Cebu to Masbate (June 1, 2013) and Taipei (July 5, 2013), as well as the airline’s first long haul flights from Manila to Dubai (October 7, 2013). For bookings and inquiries, guests can go to www.cebupacificair.com, or call the reservation hotlines (02)7020-888 or (032)230-8888. The latest seat sales can also be found on CEB’s official Twitter and Facebook pages. Those still booking flights may also sign up to be a CEB Club member through the Cebu Pacific website, for seat sale alerts, easy management of flights and travel funds, and a faster booking process. CEB currently operates 10 Airbus A319, 25 Airbus A320 and 8 ATR-72 500 aircraft. Its fleet of 43 aircraft is one of the most modern aircraft fleets in the world. Between 2013 and 2021, Cebu Pacific will take delivery of 17 more Airbus A320 and 30 Airbus A321neo aircraft orders.